The B1 Dynamics Package is a combination of three Birds-exclusive performance upgrades designed to transform the chassis of the BMW 1 Series. It includes the Quaife ATB Limited-Slip Differential, the B1 Sport Suspension upgrade, and the B1 Anti-Roll Bar Kit. 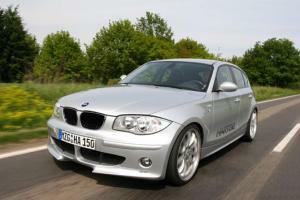 This package is available for all BMW E87 and E82 1 series variants, most popularly the 130i and 135i. Specification and price of the package can vary depending on model. What's wrong with the standard car? It is widely accepted among enthusiasts that the ride quality and handling of the standard BMW E87 and E82 1 series is poor. The reason for this is because BMW have compromised parts of the chassis for the lack of a limited-slip differential. The basic open diff used on these BMWs means that when a wheel slips and breaks traction, power is spun away through that wheel and the car loses drive. This is because an open differential always applies the same amount of torque to both driving wheels, and will only put through the amount it requires to power that spinning wheel (i.e. very little). The driver will see a light flash up on the dashboard signalling the intervention of the car’s traction control - DTC (Dynamic Traction Control). When cornering at speed it’s normal for the inside wheel to want to lift, therefore losing power. BMW have employed a very thin rear roll-bar that helps the inside driving wheel stay as planted as possible (as opposed to using a thicker one that would make the chassis more rigid and more likely to lift the wheel during cornering). The first obvious downside to this is lots of body roll. BMW have therefore countered by using very stiff springs, which is the main reason for its ‘crashy’ ride (the other being the awful run-flat tyres). The second downside is that BMW had to use a very thick front roll-bar also to limit the body roll as much as possible. Unfortunately now with a more planted rear end and less traction at the front, the driver will also experience understeer. Ultimately the fact that BMW were so reluctant to install limited-slip diffs on the standard models (reserving them only for the M-Powers) meant that they had to compromise a series of chassis components. The result is a crashy ride that makes you avoid even the smallest pot holes, a frustrating inability to put the car’s power down even in dry conditions, and excessive understeer and body roll. Birds' B1 Dynamics Package Solution. After this ‘diagnosis’ was carried out on our 130i demonstrator it was subjected to testing and development. Since the findings were similar to those of Birds' very successful B3-3.5 demonstrator (3 series E92 335i), we already had an idea of what the answers might be. It just required some careful tweaking. The B1 Dynamics Package consists of, first and foremost, the famous Quaife ATB Limited-Slip Differential. This is a unique type of limited-slip diff that uses gears only, meaning it will never wear out, and is smoother and more progressive than conventional locking LSDs - perfect for RWD road cars and is Birds’ only choice of LSD. This will allow the car to vary its torque across the axle and apply power to the ground with maximum affect in an easily controllable way. The second part of the package is Birds’ own spec of B1 Anti-roll bars. The rear-roll bar thickness is increased by 90%. Since the LSD now enables the car to apply power when one wheel slips during cornering, the stiffer rear roll bar can be used to eliminate body roll. The front is only increased by about 10%, but now closer in size to the rear (carefully calculated), the understeer is also eliminated. Last but not least is Birds' B1 Sport Suspension. The B1 Sport Suspension stands alone as the only fully customised suspension kit for the E87 and E82 1 series variants that has been made available “off-the-shelf”. Birds’ new suspension consultant Rhoddy Harvey-Bailey advised to look no further than Bilstein for dampers, but none of their sports kits were good enough. After a lot of experimentation Birds commissioned a series of carefully measured spring rates and damper curves for the different 1 series shapes and sizes, and started offering them in suspension packages. By combining these three elements you have an upgrade package that enables the BMW to ride, handle, and put power down unlike any other 1 series. One of our favourite editorials was BMWCar Magazine's comparison of the Birds B1 130i with the standard car, as Rhoddy-Harvey Bailey (suspension consultant) talks about the science of BMW suspension tuning on the last page. You can see all editorials and testimonials by using the filters in our Library. Alternatively, just google us and our products. Some of our best feedback can be found online on the BMW forums! Why are Birds upgrades and packages superior? It is important to understand the difference between Birds and other 'BMW tuners'. We do not simply resell parts, or offer a large variety of brands and products. We do not want to sell upgrades that do not work or lack value. We buy our own demonstrator BMWs. We analyse them, determine the weak areas, and develop solutions in our own workshop with our own team of consultants and engineers. We create. We have an allegiance with German BMW Tuner – Hartge – dating back to 1986, in which we have been rivalling the likes of Alpina and AC Schnitzer in creating some of the world's most stunning high-performance BMWs. Our reputation in the BMW tuning industry stems from this and is why we stand out in a diluted BMW aftermarket. As with all Birds conversions, expert advice comes as standard. We treat all customers as individuals, and recognise that every individual has their own set of desires and criteria. We have more than 25 years experience in the BMW tuning arena, more than any other organisation in the UK, and know how to get the best performance from BMW cars. We are enthusiasts and are happy to discuss in detail every aspect of the performance of your car. Options are plenty, but please let us guide you toward Ultimate BMW Performance.